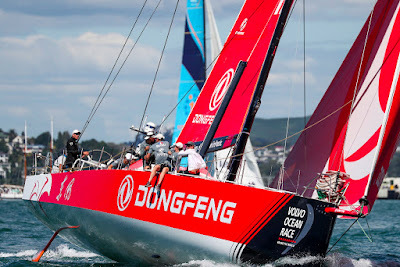 Today’s In-Port Race on the Waitematā Harbour in Auckland proved a tough one for the Volvo Ocean Race fleet, with Dongfeng Race Team finally securing the win by just over one minute after various lead changes and tricky, shifty conditions on a shortened two-lap course. It wasn’t all smooth sailing for the Chinese boat, sponsored by Dongfeng Motor Corporation, with the team forced to re-start minutes after the starting gun due to Team Brunel forcing them, and competitors Turn the Tide on Plastic (Dee Caffari) and team AkzoNobel (Simeon Tienpoint), outside of the start line. The trailing trio were quick to split as they fought to come back, with Dongfeng Race Team opting for the left-hand side of the course, a strategy that paid off when early leaders, MAPFRE and Scallywag parked up in the middle of the course with no wind. AkzoNobel and Vestas 11th Hour Racing were first around the top mark, approaching from the right hand side but Dongfeng were quick to take advantage of the new breeze and come back on the new leaders. With just seconds separating the two rivals, AkzoNobel and Dongfeng Race Team, the focus was on the fluent execution of manoeuvres and retaining consistent speed in the light winds, Dongfeng Race Team made the most of every zhephyr of wind and in the final stages of the race, the red boat eased over the top of team AkzoNobel at the final gate to cross the line in first place, with MAPFRE securing the final podium spot and retaining their lead position overall in the In-Port Race series. Leg 7 starts on Sunday 18 March, with the sailors facing a tough leg to Itajai, Brazil. The 7,600 nautical mile leg will be a defining leg of the Volvo Ocean Race, with double points at stake for the winner and an extra bonus point for the team that rounds Cape Horn first.